It’s a warm, summer night and a snake has found its way into your house. It slithers across the floor, moves up the side of the couch in the living room, and coils up under one of the cushions, waiting to be discovered. This is a nightmare scenario for any homeowner, especially if there are young children or pets living in the home. Hopefully these incidents are kept to a minimum; but when you need help with snake removal in the home, Critter Control of Miami will be there to help.Snakes are one of the most common fears people have, and for good reason! Even if they’re not poisonous, they need to be dealt with quickly. 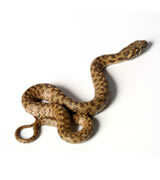 When there are snakes around or in your home, remain calm and contact us immediately. Learning the risk factors for a snake invasion is a key step in keeping your home protected. Snakes are always looking out for a place that provides them with food and shelter, so make your home less desirable for them. Rodent control: If you’re dealing with rats and mice on your property, snakes will soon follow. Check your home routinely for any entry point: Snakes have been known to get into a house through a hole that’s less than ¼ inch big. Keep your doors and windows sealed and check for cracks in the foundation. Keep your yard clear: Snakes are drawn to cool areas where they can stay hidden from sight. Keep the landscaping under control and remove all tall weeds and any random items scattered throughout the yard. Don’t handle the snake. If you want to try and identify it, only do so if you’re able to maintain a safe distance at the same time. Any snake can try and attack if it feels threatened and even if it’s not a poisonous type, it can still pose a risk. If you are bitten, call poison control and seek medical attention immediately. Once you are away from the area, call Critter Control of Miami and let us take over the situation for you!